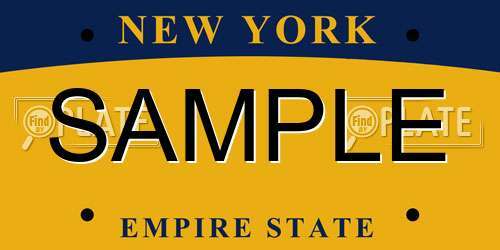 You can register your vehicle and obtain license plates in New York from the Department of Motor Vehicles. There are various license plates to choose from such as, standard plates, specialty plates, or disability plates. Most of these plates have the option to be personalized with a custom plate number. To look up available plate numbers in New York, use the search bar above. Vehicles owned by New York residents must be registered with the Department of Motor Vehicles (DMV). Most of these license plates can be personalized to have a custom plate number. Personalization requires an application and has to follow the DMV’s guidelines. In addition to the plates listed above, there are also temporary license plates. Temporary license plates are required if purchase a new vehicle and permit you to drive legally while you wait for your vehicle’s registration to be processed. Temporary plates are valid for 30 days only and they cannot be renewed. The fees for specialty plates vary by type. To obtain a complete list of available plates and the prices to register, please contact your local DMV office. You application will be processed by the NY DMV and you may be required to provide additional plate numbers if your first choice is not selected. The decal stickers on your rear license plate indicate when your vehicle’s registration will expire. You may receive a notification in advance, reminding you that it is time to renew your registration. Renewing your vehicle before the stickers expire allows you to avoid any unnecessary late fees. Note: Vehicle inspections are required every 12 months and you may be required to submit a certificate upon renewal. It is possible to replace any lost, stolen or broken license plates at the NY DMV. If your license plates are stolen, you may be required to submit a police report. You may have to wait for your new placements to arrive by mail. Note: Replacements for stolen license plates are free with a valid police report. You may transfer your license plates to a new car if you have sold your previous vehicles. Your license plates cannot be transferred to anyone when sold. When you transfer your plates, you’ll be required to pay a transfer fee at the DMV. If you aren’t going to purchase a new vehicle, you may be required to surrender your license plates. You are also required to surrender your license plates when you move to a new state. Note: Motorcycle license plates do not have to be surrendered. License plates fees in New York vary by plate type and vehicle type. You may be required to pay state taxes and service fees in addition to the standard registration fees. Your renewal fees will be based on your vehicle type and the type of license plate your chose to register. You can look up license plates in New York using the search bar above. All you need is the plate number and the state and you can find whether the plate number is available.